interior designer sharing her ideas and inspirations. I found this table setting online (no idea where it was from, sorry!) and absolutely love love love the vase! I must find this! 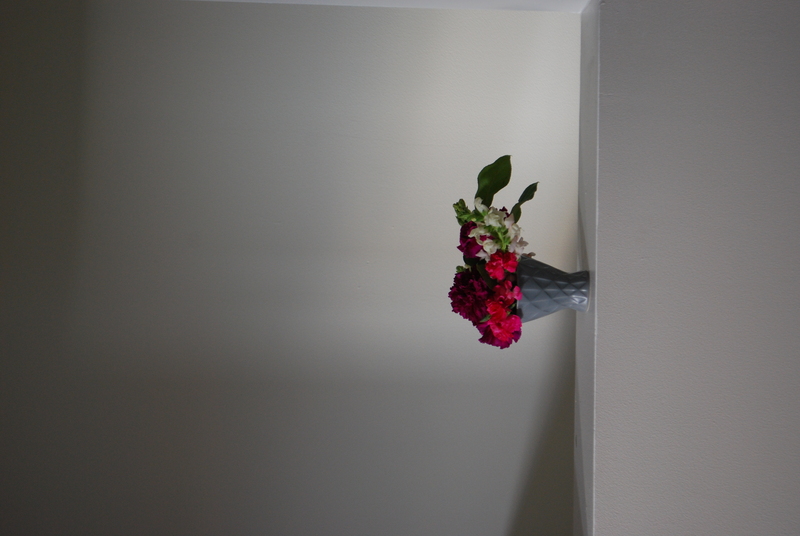 The overall scale, sculptural shape zinc vase, and single flower color is a terrific combination. 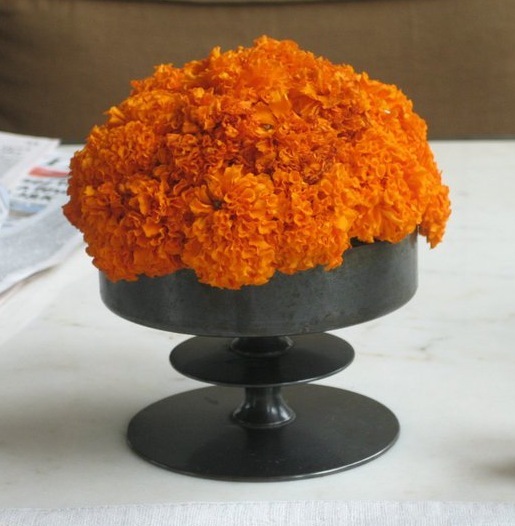 It’s not too late to create a similar arrangement – simply bring in a clean and small outdoor zinc planter and plop in orange chrysanthemums as the plant! Easy breezy! I love sculptural vases or pots. I find that most times I am drawn to the ornate, geometric, or colorful designs. However, pure white and simple sometime wins. On a flea market trip in NYC last year, I passed over a beautiful small, round, multi-colored floral pot that was being sold for $50. The guy would not take $40 so I moved on. The price tag was a bit too high for me that day (must have been dropping coin on lots of other goodies in NYC that weekend). What was I thinking! Too small? Too busy? Too much moolah? I’ve been picturing it ever since. Here are a few that make any day brighter and any flower that much more beautiful. It’s growing time. The local plant nurseries are being rummaged by DIY gardeners getting their green thumb on fresh flowers and pretty planters. 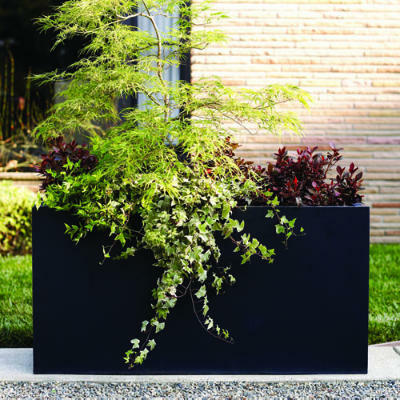 Container gardens are simple ways to plant your favorite flower, herb, shrub or vine without committing to a larger landscape project. And if you’re like me and have a teeny parcel of land to dress up, a few flushing mini gardens set in planters is the way to go. Sunset Magazine shares with us some beautiful ideas. Now get growing! 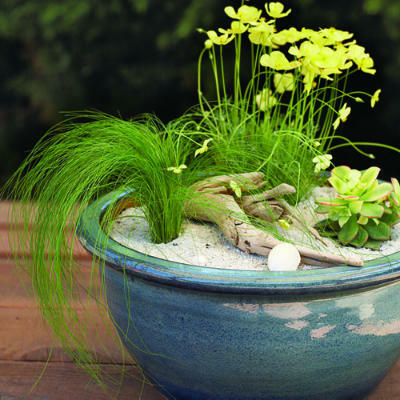 Bringing the beach to your balcony with sand, driftwood, and slow-growing plants. 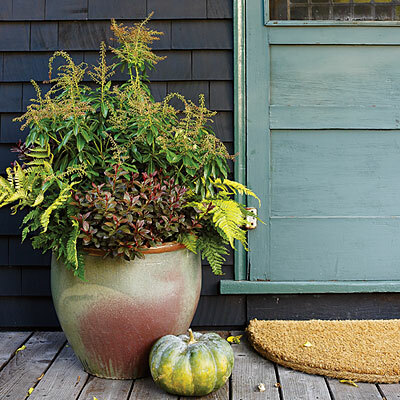 Bronze colors glow in perennial azalea, fern plants and shrubs. A mini landscape for an urban dwelling towers with azalea, ivy, and a small maple tree. 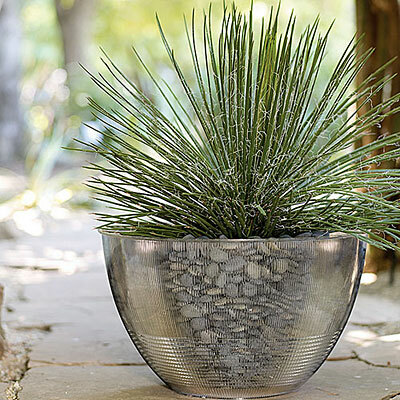 Be edgy and green with a pot made from a an old light fixture. 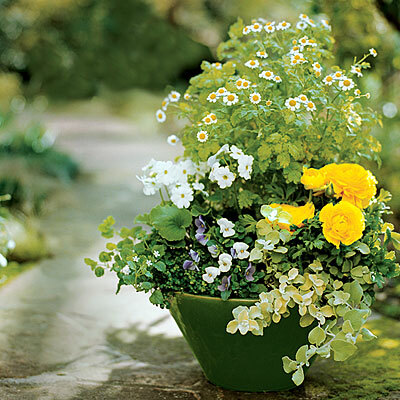 Bring Spring to your steps with layers of small greens tinged with white and yellow flowers. 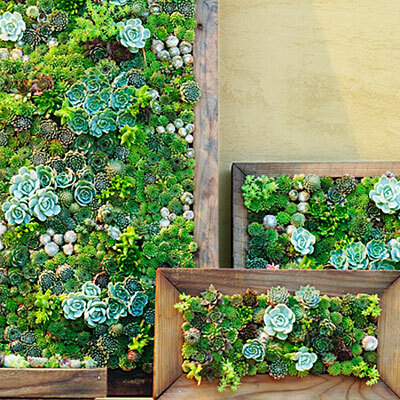 Take it to the wall with a vertical textural garden of colorful succulents. 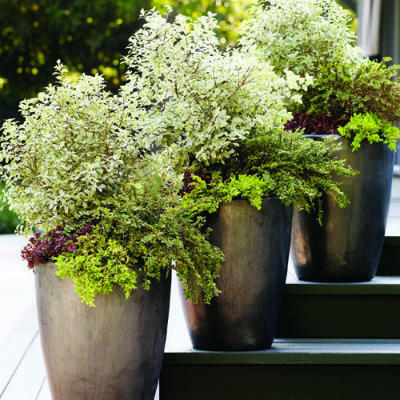 Make a big entrance with a row of 24"round contemporary pots filled with sedums, Cotoneaster, and junipers. 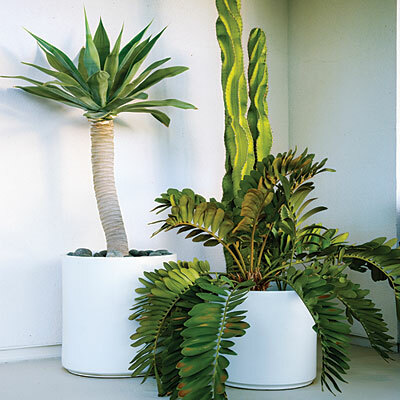 Keep it light and white with ceramic planters and bold sculptural plants like agaves, ferns, and other simple specimens. 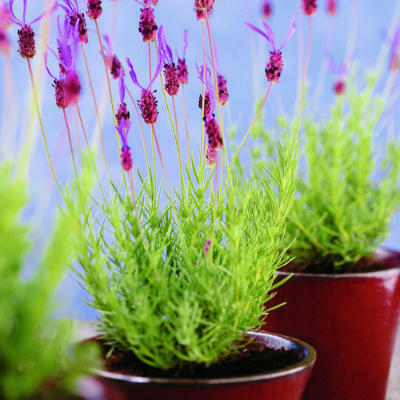 I love lavender and this dwarf variety is a perfect pairing for a series of small pot. 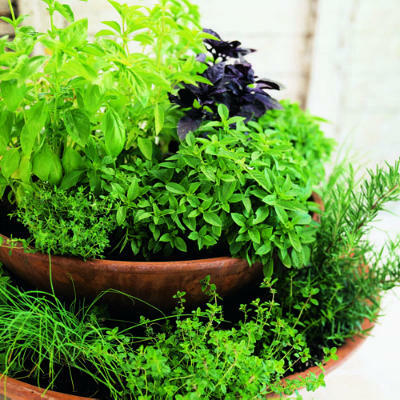 Dinner is ready with a simple two-tiered herb garden tumbling with chives, rosemary, thyme. 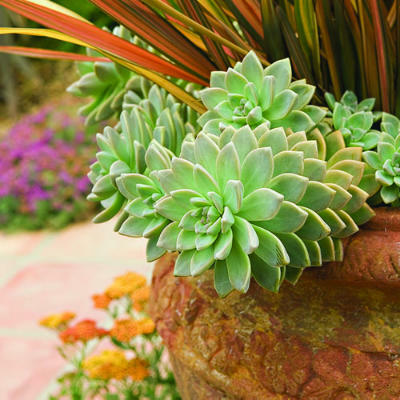 Drought tolerant plants like the Echeveria and New Zealand flax are perfectly potted in a dry warm weather climate. 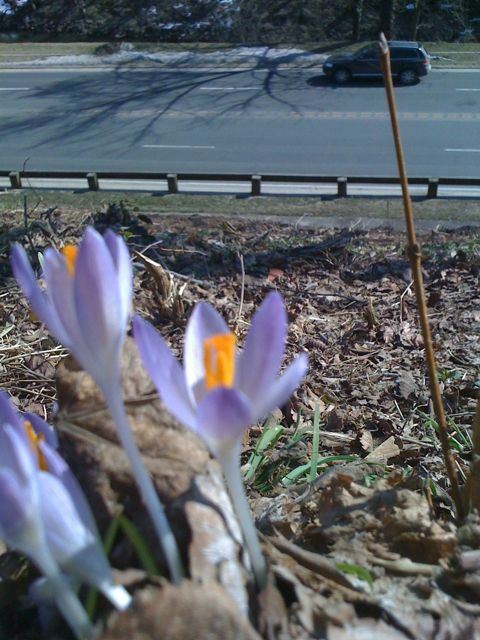 I spotted purple crocus flowers blooming along the hillsides in Rock Creek Park. Spring is almost here Washington! And so are my sandals from Urban Outfitters (if UPS shows up tomorrow!) Early for open toe shoes, maybe yes, but it feels great to begin some early Spring apparel shopping! This photo was taken by moi the other day. Its a simple scaled down arrangement made from the leftover deep pink flowers that survived a week in my much larger Valentine’s Day bouquet. I love the moodiness in the image. The shadows fade beautifully and the subject of the photo has pretty shades of pink, blue and green. I have so much fun with photography and love experimenting with still life and portraiture. The small ceramic vase is by Jonathan Adler. It Starts with A Seed. Spring is around the corner. Well, not really. But it will show its sunny self when we least expect it. And that means, it’s time to think about plans for spring time gardening. “We love Target” is going to have the shelves full of weed killers, seed packets, and fancy lanterns in no time. So, in preparation for the mass rush to buy buy buy, dig dig dig, water water water, and then enjoy the flourish, get brushed up on your seed germination education. 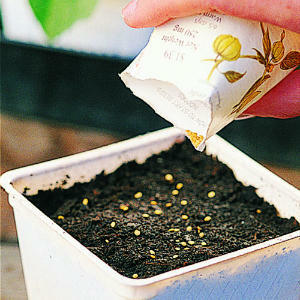 Sunset shares with us tips on starting crops, flowers, and plants from seeds. Don’t fret – its not that hard. You just have to be diligent about watering and feeding. Need professional decorating help? Click on the MBD icon below.